The modern statecraft of the United States of America a fascist nation state. The perpetual bellicose zeitgeist of the United States since World War II has been the handmaiden to fascism. The steadfast and often unnoticed veneration of a strong centralized nation state is the hallmark of fascist statecraft. A vociferous loathing of socialistic ideals is a key component of the fascist doctrine. Combine these two elements with aggressive militaristic tendencies, usually beneficial to the state and the state sanctioned industries, and the recipe for a totalitarian fascist nation is complete. America has clandestinely undergone a transformation from a Democratic Republic to a Crypto-Democratic Fascist Nation. The telltale signs of this can be seen in public veneration to the national flag (the pledge of allegiance), the financial coddling of multinational industries geared toward military manufacturing and national agencies which clandestinely police the populace searching for descenders and then applying pressure to remain within party lines. Although this paper will support the thesis that the United States of America is fascist, an exhaustive documentation of such an assertion falls outside the scope of this paper. In order to determine if the United States of America is indeed fascist it is essential to have a clear definition of what is meant by fascism. During the the second and third decades of the 20th century the world was witnessed the assent to power of two iconic fascist regimes in Europe, Adolf Hilter's Germany and Benito Mussolini's Italy. Much of what is inferred about the nature of a fascist nation is gleaned from on of these two models. In an interview with Noam Chomsky, a leading American intellectual, told reporter Matthew Rothschild; “The Weimar Republic was the peak of Western civilization and was regarded as a model of democracy... (but) No analogy is perfect....but the echoes of fascism are “reverberating today” (Rothschild, 2010). Daniel Guerin was a French Anarcho-communist and prolific writer of treatises which extolled the virtues of communism and anarchism while lambasting the fascism and fascist nations of most notably the German fascist nation under Hitler. In the year 1938, which corresponded with the fascist power grab in German, Guerin provides, in his book Fascism and Big Business, a simple and succinct definition of fascism. He writes; “...fascism is reduced to this: a strong state intended to prolong artificially an economic system based on profit and the private ownership of the means of production...”(Guerin, 1973). Guerin went on the explain what the cornerstone of that economic system was; “...big business approves of an aggressive policy that brings it new armament orders...”(Guerin, 1973). In other words, fascism is a powerful, centralized and militaristically combative state that overtly subsidizes war goods manufacturing all of which occurs within an anti-socialist public rhetoric. Hitler and Mussolini's brand of statecraft were populist reactions to what they viewed as to rampant and financially destructive capitalism, monarchism and colonialism. Daniel Guerin explains; “The crisis of the capitalist system itself is what shook capitalism to its foundations by drying up the sources of profit. The working class, on the other hand, paralyzed by its organizations and its leaders in the hour of the decay of capitalist economy, did not know how to take power and replace dying capitalism with socialism” (Guerin, 1973). Finally, President Dwight Eisenhower gave a harrowing and bleak cautionary note to the American people about the emerging dangers of fascism during his farewell address, January 17, 1961. It must be noted that the United States had fought and defeated, in the European theater during WWII, the fascist regimes of Hitler and Mussolini. However, the United States had never demilitarized to a peace time size of the armed forces after the conclusion of World War II. Eisenhower forewarned America; “In the councils of government, we must guard against the acquisition of unwarranted influence, whether sought or unsought, by the military-industrial complex. The potential for the disastrous rise of misplaced power exists and will persist. We must never let the weight of this combination endanger our liberties or democratic processes. We should take nothing for granted. Only an alert and knowledgeable citizenry can compel the proper meshing of the huge industrial and military machinery of defense with our peaceful methods and goals, so that security and liberty may prosper together” (Eisenhower, 1961). Thusly, even then the tell tale signs of fascism were apparent in America: a strong centralized government with militaristic tendencies, a thriving war armaments industry and a distain for socialistic ideals. Guerin, Daniel, Merrill,Frances. (1973). 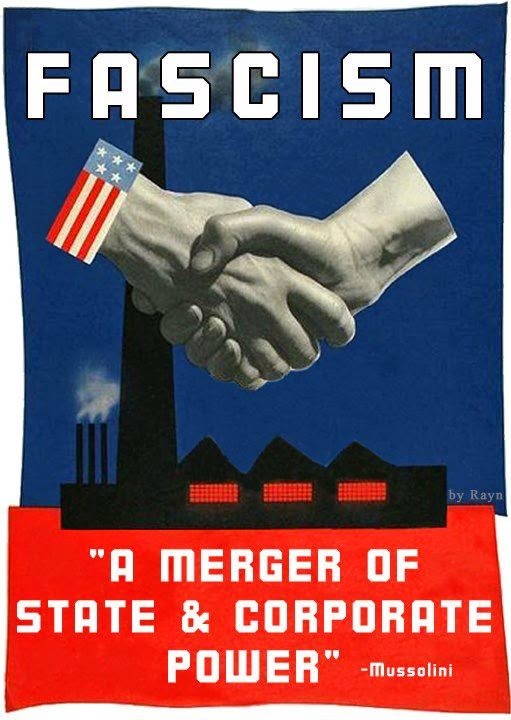 Fascism and Big Business. New York: Monad Press. Weiner, Tim. (2004). Lockheed and the Future of Warfare. New York: New York Times (November 28, 2004).